A celebrity penguin, which made international headlines after forming an attachment to a cardboard cut-out in a Japanese zoo, has died at the age of 21. Tobu Zoo in Japan's central Saitama prefecture announced Grape's death through its Twitter account, saying that the cause of death was unknown. But according to NewsWalker, he would have been around 80-years-old in "human years". Grape the Humboldt penguin became on online star in May after seemingly falling in love with the picture of Hululu, an anthropomorphic penguin character from the Japanese anime series Kemono Friends, after it was placed in his enclosure, the RocketNews website reports. He is thought to have become fixated on the cut-out after being jilted by a female penguin called Midori, which had been his mate for a decade. The cut-out was originally placed in the penguin enclosure as part of a tie-in promotion with Kemono Friends. 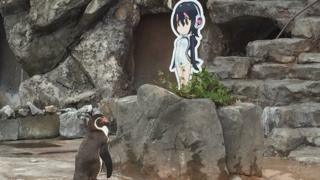 Grape spent long hours staring at Hululu and refusing to leave her side, and so staff decided to leave the cut-out in the penguin's enclosure, long after the promotion ended. Sadly, his death comes a month before the zoo's Grape Festival, a series of events spanning two weeks based around the celebrity penguin. HuffPost Japan notes that condolence messages have already been received from Kemono Friends, and Chikuta Ikuko, the voice artist who plays Hululu in the series. "Best wishes from my heart to little Grape," Ms Ikuko wrote on Twitter. Social media is already filling with memes mourning his death. "Let's go home, Grape-kun," says one simple tribute.